Last month, Melania Trump announced a new White House initiative to address some of the problems facing children today, especially those related to their social and emotional development. You can be sure that the separation of infants and small children from their parents by Immigration and Customs Enforcement officials is not one of the issues the awkwardly named “Be Best” initiative will be taking on. Instead, the First Lady wants to focus on cyberbullying. According to the “Be Best” website, Mrs. Trump believes that children “must choose their words wisely and speak with respect and compassion.” This may qualify as the most ironic statement ever issued officially by the White House, given that cyberbullying seems to be the president’s preferred means of communication. His twitter feed is replete with belligerent name-calling that would violate the code of conduct of practically every school and business in the country. One can hardly believe the audacity of this White House thinking it is in a position to lecture America’s children about treating each other with “respect and kindness.” It is the president who should be doing the learning. His education could begin with a visit to the Henderson K-12 Inclusion School in Dorchester to see what it takes to create a community that is welcoming and inclusive to all. At the Dorchester Avenue school, “inclusion” is not just a nice-sounding buzz word. It is at the heart of everything the school does. I have seen this first hand as the parent of a medically complex three-year old who started pre-school there in September. My daughter Lucy has been a cherished and well-supported member of the school community from the day she walked through the doors with her posterior walker, feeding tube, and limited oral expressive language. The Henderson’s graduation ceremony was held this week in historic Faneuil Hall, and at one point, the Cradle of Liberty rocked to the spoken poetry of Kanbe Mao, the school’s impressive valedictorian. Like many of Boston’s high school students, Kanbe is a child of immigrants. His family moved to the US from war-ravaged Cambodia in 1981. His father loved rap music and introduced him to artists like Tupac and Biggie. Kanbe wrote his first rap when he was in the fifth grade and found the writing process to be a great stress reliever. Another important part of Kanbe’s experience at the Henderson has been Strong Men Strong Leaders, a character building organization and popular elective that focuses on physical fitness, community service, combatting negative narratives about men of color, and discussing successes and challenges in their lives and neighborhoods. Started three years ago by Samuel Texeira, a beloved history teacher the students call Mr. T., the group has helped foster a respectful school culture. Inspired by the #Me Too movement, the group took on the issue of sexual harassment this year, which has had positive ripple effects throughout the school. 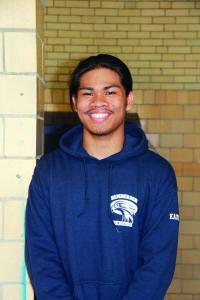 Kanbe joined Strong Men Strong Leaders as a sophomore and served as its president this year. He described his experience with the group as transformative. It has helped him form deep and meaningful friendships and grow from a kid into responsible young adult. Remarkably, Kanbe is one of two “Strong Men” to receive this year’s highly competitive Posse scholarship, which helps “young people with extraordinary potential” overcome barriers to access higher education. In the fall, he will be one of ten Posse scholars from the Boston area who will be attending Center College in Kentucky on a full four-year scholarship. The group has been meeting weekly since January for hands-on workshops to prepare them for the college experience. What about after college? Kanbe aspires to become a teacher or a nurse, caring professions that would suit him well. I wish the president would come to Dorchester to meet this admirable son of immigrants and graduate of an incredible public school built around the idea of inclusion. It could be the start of a learning process for him that should have begun a long time ago.